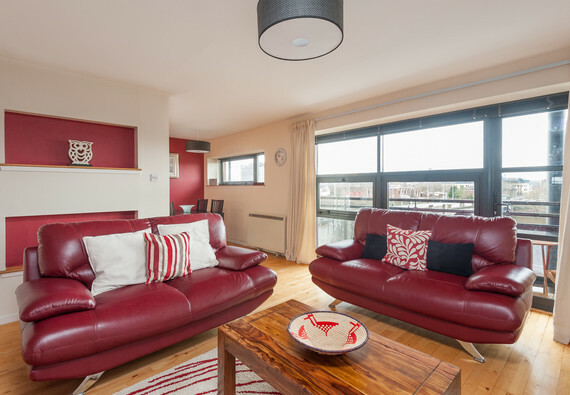 The Carrick Quay apartment lies on the banks of the River Clyde and enjoys wonderful south facing views across the River. The building offers its residents a central location close to St. Enoch Shopping Centre and within short walking distance of Glasgow Central Railway Station. The building has security entry, an elevator and private car parking for one car. The apartment has been recently refurbished and will provide a very comfortable stay for travellers of any kind. There are two bedrooms. A twin bedroom and a master bedroom with en-suite shower room. The main bathroom has a bath and shower over and can be accessed along with the other bedrooms from the newly carpeted hallway. The living area features a small mezzanine level with desk, and is a perfect space to use the complimentary wifi. The lower level includes two leather sofas, flat screen TV, table games and assorted side tables and lamps. The dining kitchen and four tables is set adjacent to the living area. The kitchen includes all appliances, and is suitable for all modern cooking requirements. A dishwasher and washing machine are included. The balcony overlooking the river can be accessed from the living area also. Accessibility statement There are around five steps within the property entrance leading before the elevator. There are also steps at the back of the property. Therefore the property is not wheelchair accessible. No reviews yet for Carrick Quay Apartment.